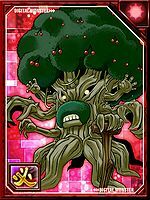 Woodmon evolved further, and as Jyureimon, it is a Digimon that has acquired extreme intelligence and power. Called the "Lord of the Deep Forest", it is a terrifying Digimon who tempts Digimon who have gone astray in the dark deep forest to go further and deeper into the woods, so that they will never break out of that forest. 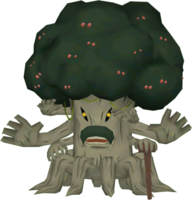 The fog it generates from its body displays illusions, tempting the opponent into the forest depths, where it uses its branches like tentacles and ivy to capture the opponent for its own nutrition. 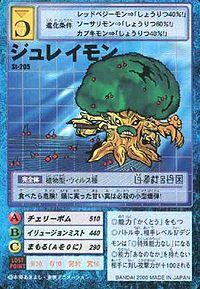 If you notice a Woodmon that has lived a long life, it is probably wise to fell it before it evolves to Jyureimon. 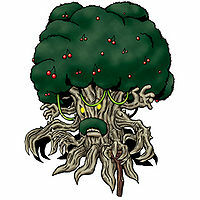 Its Special Move is the forbidden fruit that grows from the branches on its head (Cherry Bomb). It tempts with its fragrant smell, but certain death awaits if this fruit is eaten. — Digimon Adventure: "Jyureimon of the Lost Forest"
— Digimon Frontier: "Ranamon's Tenacity! Female Digimon Personal Combat"
— Digimon Savers: "Digimon Boy Ikuto, The Forest Keeper Jyureimon"
Title: 「樹海の主」 — "Lord of the Deep Forest"
1) n., 「樹齢（ジュレイ）」 means "the age of a tree"
2) n., 「寿齢（ジュレイ）」 means "long life"
Anime/Manga Digimon Adventure: "Jyureimon of the Lost Forest"
チェリーボム Cherī Bomu Pit Pelter/Cherry Blaster/Cherry Bomb Shoots explosive cherries from its foliage. If swallowed, the cherries cause instant death. Creates a thick fog to confuse the enemy with illusions. 에너지흡수 Eneoji Heubsu Illusion Mist Absorbs vitality from an enemy. 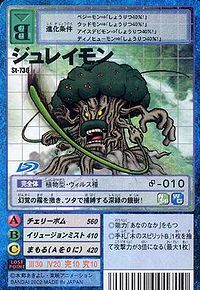 Tsuta Kougeki  Ivy Attack つた攻撃 N/A Vine Attack Whips or ensnares the foe with vines. 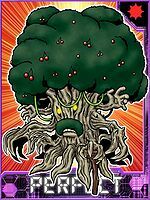 Jyureimon was a minion of the Dark Master Pinochimon who turned Ishida Yamato against the other Chosen Children. Pinochimon killed him when he said that the Chosen Children had something that Pinochimon was lacking, friends. A Jyureimon went wild in New York but Motomiya Daisuke, Tachikawa Mimi and the American Chosen Children worked together to pacify Jyureimon, Lilimon shoot his Flower Cannon and turns Jyureimon calm, and the Chosen Children return him to the Digital World. 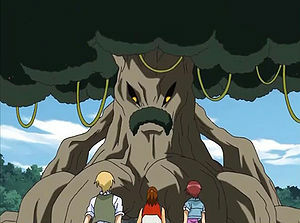 A group of Woodmon evolved into Jyureimon due to Culumon's evolutionary powers. Jyureimon guarded the wood element sphere of Sephirothmon. Shibayama Junpei spirit evolved into Blitzmon to battle him and defeated him. 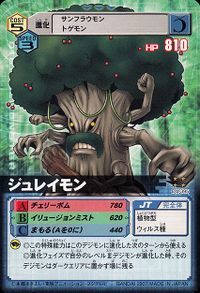 A Jyureimon guarded a misty forest and risked his life to protect the Digimon there, including a group of Nyokimon. The Great Free-for-all Fight in New York and Hong Kong! In the Misty Trees region, a thick fog covers the land and prohibits passage into Toy Town and Freezeland. Tonosama Gekomon grants minor protection from the fog to Hiro, but only by meeting Jyureimon can the fog be made completely passable. Jyureimon is a remarkably wise, intelligent digimon who offers to teach Hiro and his partner. 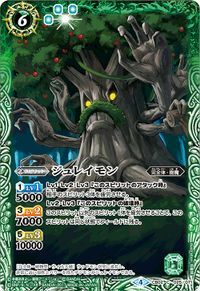 Choosing partner will initiate the "Teachings of the Forest" training, which boosts intelligence and MP. If Hiro chooses to listen himself, Jyureimon reveals a great deal of information that, while it isn't necessary to progress, illuminates some of the mystery surrounding the memory crisis. Jyureimon is the holder of the Misty 7s card. 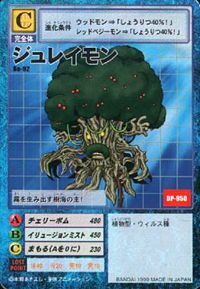 Jyureimon is an obtainable Digimon. 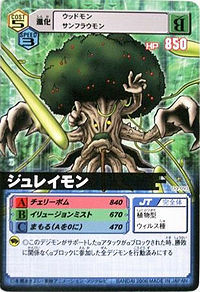 Evolves from Red Vagimon (0+ DP), Vegimon (0+ DP) or Woodmon (0+ DP) and can evolve to Pinochimon (0+ DP). Jyureimon is an unobtainable enemy Digimon. Can be evolved from Woodmon at level 25 and evolves into Pinochimon at level 41. Evolves from Woodmon or Red Vagimon. Can Jogress to Pinochimon with a compatible Digimon. It's dangerous to eat them! The sweet fruit that grow on its head are actually small bombs! This hungry, deep-green tree spreads hallucinogenic mist and uses its vines to capture its enemies! The fog creating master of the woods! This old tree controls the gloomy forests, accompanying the fog and surrounding itself with ivy! 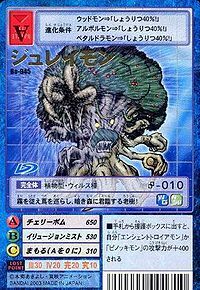 Jyureimon is a Digimon that has acquired extreme intelligence and power. ↑ Digimon Adventure V-Tamer 01: "Desperate X Death! Ultimate Appears!!" This page was last modified on 21 March 2019, at 17:24.